Bad news for all the Todd La Torre fans out there as Queensryche have had to postpone their Dublin show which was due to take place on April 19th. 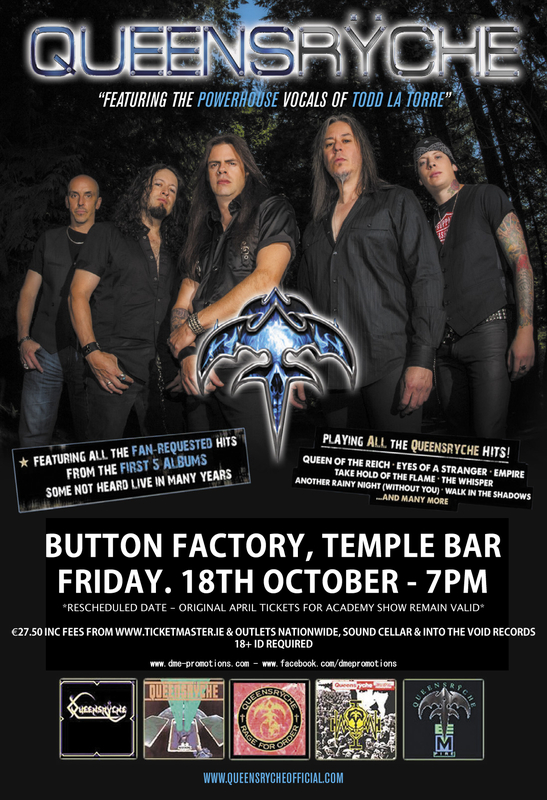 Instead, the band will return to play the show on October 18th and will move to The Button Factory. Original tickets are still valid. The postponement applies to all of the bands schedule European dates so fear not, they haven’t singled out Ireland (like Rob [f**ko] Zombie – in case you forgot…because I never will). This entry was posted on March 28, 2013 at 5:38 pm and is filed under Gig Listing, Music, News with tags Academy, Button Factory, Postpone, Queensryche. You can follow any responses to this entry through the RSS 2.0 feed. You can leave a response, or trackback from your own site.